The basics of Project Management as defined by the Project Management Institute‘s Project Management Body of Knowledge (PMBOK). This article gives a broad overview and kickstarts a layman into the fascinating world of Project Management. Use project scope tools to analyze contractual requirements and generate Project Charters and Project Breakdown Structures. Discuss and demonstrate knowledge of project cost tools to establish cost estimates and perform cost tracking using Earned Value Analysis. Use time tools to develop Gantt charts, perform Critical Path Analysis and establish strategic plans, tactical plans, and contingency plans for effective time management and allocation of resources. Gain the knowledge of proven techniques to complete projects on time, on schedule, and within the scope of work in order to generate excellent customer satisfaction and repeat business. Project Management Body of Knowledge (PMBOK) definition: “A project is a temporary endeavor undertaken to create a unique product or service”. Every project has a definite beginning and an end. The product or service is different in some distinguishing way. Examples: Developing a new product, changing the structure of organization, implementing a new design process. Operations are not projects: Operations are ongoing and repetitive. Temporary – The end is reached when Project objectives are achieved, or Project is terminated. Temporary does not necessarily mean short in duration. Temporary does not apply to project’s products or services. All temporary tasks are not projects. Temporary nature of projects may apply to other aspects: the opportunity is temporary, the project team is temporary. Unique – Involves doing something which has not been done before. The project might have repetitive elements. The characteristics must be progressively elaborated. Elaboration of product characteristics must be coordinated with project scope definition. Ideally the scope of the project should remain constant as the product characteristics change. Integrates the concepts of temporary and unique. As the product is unique it should be progressively elaborated. The scope of the project should remain constant even as the product scope is progressively elaborated. Programs: “A group of projects managed in a coordinated way to obtain benefits not available from managing them individually” e.g. e-commerce program manager. Programs may involve repetitive undertakings. In software organizations project management is usually considered to be a subset of program management. Subprojects: Division of projects into more manageable components; Can be contracted out to an external organization e.g. IV&V is performed by an independent organization. “Project management is the application of knowledge, skills, tools, and techniques to project activities in order to meet project requirements”. 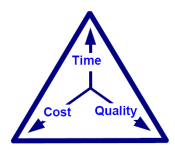 Requires balancing of scope, time, cost and quality. Project Management is achieved in five phases: Initiating, Planning, Executing, Controlling, and Closing. Include an Analysis phase before closing to help gain lessons from each project. Project Management helps to ensure available resources are used in the most effective and efficient manner. In PMBOK project management knowledge and practice is described in terms of component processes. Component processes are organized into 9 knowledge areas. Comindware: Free task management software and innovative issue tracking system. Other Comindware products for project management are in the pipeline. All of them can be easily shaped to your business needs as they are built on the basis of the same Semantic Data Storage platform.